For the past few months, I’ve been playing Madden NFL 17 in my free time. I really enjoy the team-building aspect of the franchise mode, where I’ve taken on challenges such as finally bringing the Lombardi trophy home to Philadelphia. As a data nerd, one thing I love about Madden NFL is their player rating system, where they assign numerical values to practically every aspect of every player’s abilities. These ratings are then summarized into an overall player rating (OVR for short), which is a fairly good indication of how skilled a player is and how dominant they will be on the football field. If you don’t care about how I computed the ratings, feel free to skip ahead to the “master equation” section. The Madden NFL folks have been pretty awesome about sharing their player rating data. We can look up and download all of the active player ratings directly from the Madden NFL web site, which I’ve done and shared in a Google doc here. For this post, I’m working with the preseason ratings. Since no analysis is complete without some basic exploratory data analysis, let’s take a look at the distribution of overall player ratings, which is what we’re looking to model. The chart below is a violin plot, which is a combination of a box plot and histogram. Basically, it shows the distribution of Madden player OVRs. 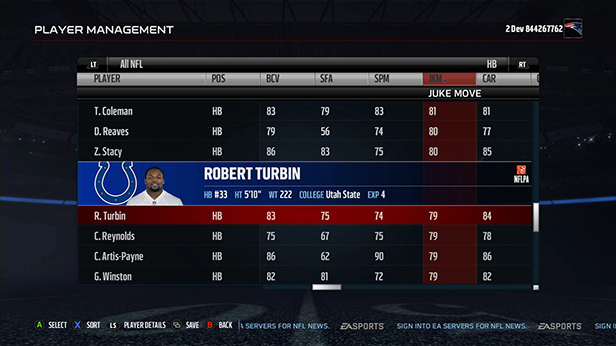 All of the players rated in the low 40s OVR are TEs, which seems quite odd. Do NFL coaches like to hoard crappy TEs? Why would professional football teams keep players who are rated so poorly that they’re statistical anomalies (in a bad way) when compared to the rest of the NFL? After a little digging into the player rating spreadsheet, it seems that nearly all of these low-40s OVR TEs are actually long snappers, and the Madden NFL folks decided to make them TEs for some reason. Since Madden NFL doesn’t currently feature long snappers nor a long snapping skill, my guess is that most of these long snappers don’t even make the preseason cuts in most Madden games. Another interesting finding from the above chart is that kickers and punters tend to have the highest OVR, on average. This is likely because there’s so few kickers and punters in the league (typically, only one of each per team), and few teams (except for the 2016 Buccaneers) keep a kicker or punter around if they don’t excel at their job. There are many more interesting statistics to look at in this data set, but in the interest of brevity, I’ll leave those charts for another post. Now that we have a basic understanding of the data set, we want to find the “master equation” that turns player skill ratings into their OVR, which represents how good of a player they are in Madden. To accomplish this goal, I trained a linear model (with Lasso regularization) to predict every player’s OVR based on their skill ratings. Essentially, I gave the model every player’s skill ratings (speed, strength, throw power, etc.) and asked it to predict each player’s OVR for me. Since each position’s OVR is calculated differently—throw power is far more important for quarterbacks than defensive tackles, for example—I grouped the players by their position and trained a different linear model for each position. Thus, we’re no longer looking for a master equation; we’re looking for the master equations. Tom Brady OVR = 10 + 0.5 x 94 + 0.25 x 98 + 0.2 x 98 + 0.1 x 84 = … and so on. Obviously the above equation was made up, but let’s take a look at the master equations that the linear models discovered. Below, I made a heatmap of the player traits that affect each position’s OVR. Darker purple cells indicate important traits for the position, whereas light purple or blank traits have little to no effect. The number in each cell is the linear model’s coefficient, which is the number that’s multiplied by the trait in the master equation. … which seems to suggest that we could make our own master equations to find every Madden player’s “True OVR.” We’ll leave that task for a future post, though. The estimates from these equations are just that—estimates. The predicted OVR may be a point or two off from the real OVR, but most of the time it should be correct. The team’s scheme (4-3 vs 3-4 defense, for example) will affect a player’s OVR for that team, which may cause some of the predicted OVRs to be off by a point or two. These equations are based on the Madden 17 preseason ratings. They may change in the future at the Madden developer’s whims. These equations are from a linear model, and it’s possible that some traits have diminishing returns at some point. If some traits have diminishing returns, we may need to build a more complex model for those traits. Feel free to add your thoughts in the comments. Now that we have the Madden master equations, what can we do with them? So with this program, have you just created a “Money Ball” situation wherein online Madden players will want to create their own teams based on a custom roster suited to their play book? Perhaps a tool to suggest the best current team for a person to use given their play style? I suspect that’s one advanced tool we can make with a model like this, yes! Probably need to figure out how players are affected by each team’s scheme first, even if it’s a small effect. I especially like the idea of optimizing a team that will play well but cost very little. I think that would be a great application to introduce machine learning to the masses, and be legendary in the Madden community. Could host a subreddit where the goal is to be the best player, with the “cheapest” team. Tradeoffs between cost and skill, and optimizing like crazy would be a great blend of technical chops, and downright fun in gaming. Is that even a possibility in the current game? One thing I noticed that might be off is on defense how awareness and play recognition are weighted. EA says they’re evenly split, but your results show otherwise. I think that’s because in EA’s default roster they have every defensive player with equal ratings in awareness and play recognition. Thanks for sharing, Alex! I saw those charts a couple weeks ago when doing my initial research for this project, but it’s still unclear how to translate those percentages into actual scores. I can’t imagine it’s simply a matter of summing the percentages multiplied by the trait values, as that wouldn’t sum to 99 for pretty much all of the players. This is so interesting and understandable. Thanks for sharing this explanation. Exactly what I was looking for. This is an excellent information!!! Very well explained. This looks interesting, thanks for the detailed explanation! What is the simplest way to download the player ratings database? Is there an easier way to download them then copy and paste?